As seen on "Exploring The Unknown!" and the Travel Channel. Great for bus groups, corporate parties and the unafraid! An experience you'll never forget! Not for the timid or weak at heart! Paranormal demonstrations that end with an actual dark Victorian seance! You've heard about our seances on TV, now you can be part of one! Held in a building that is over 100 years old, said to be haunted by the ghost of a murder long ago! Learn about George Valentine- "The man who challenged Houdini!" A medium from the 1900's, who manifested seances in the Poconos & NE PA! Is eyeless vision possible? Do the dead return? Did you ever have a premonition come true? See the strange powers imparted to a person struck by lightning! Includes a showing of two original psychic oil paintings by legendary Nino Pecoraro! We dare you to stay till the end! Shows year round by reservation only! Psychic Theater Productions takes to the stage a new production in the theater of the Houdini Museum. The show is entitled "Haunted," and tells the story of hauntings at 1433 N. Main Avenue that were reportedly connected to a murder / suicide and other tragedies in the building beginning in the 1920's. Photos and newspaper articles of the happenings will be on display. Much of this is based on real people and events including area spiritualist, George Valentine, "the man who challenged Houdini!" That part of this drama was even reported in The New York Times over a three week period. The show ends with a dark seance where the spirits of the protagonists are summoned. A multi media event, with the audience participating throughout, including, of course, during the seance. 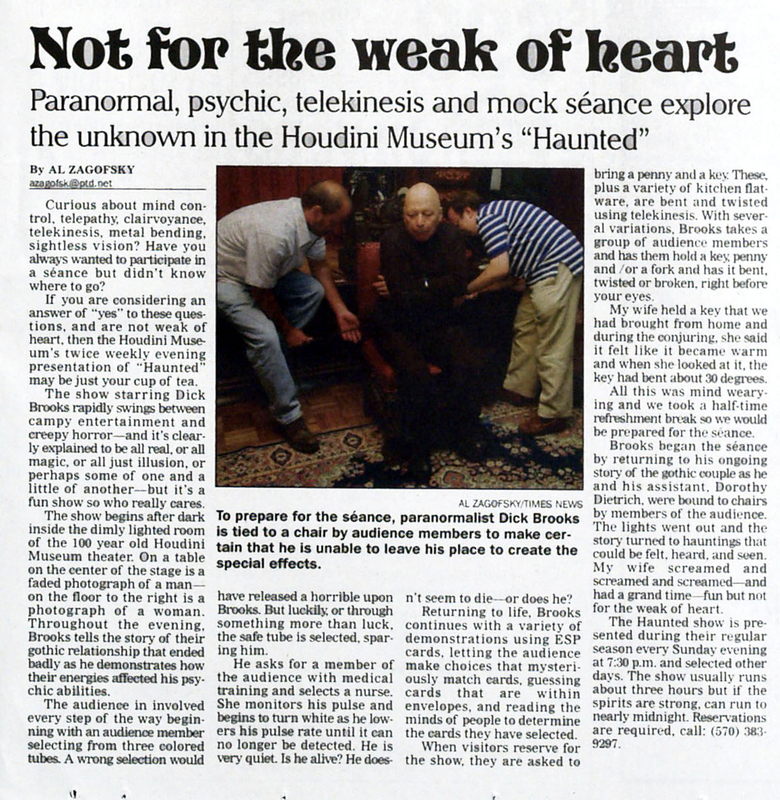 The story includes on the spot experiments in mind control, telepathy, clairvoyance, telekinesis, metal bending, sightless vision, and the dark seance. National television shows such as Discovery Channel's "Exploring The Unknown," The Biography Channel, and the BBC's Dead Famous have visited the building at 1433 N. Main Avenue on several occasions to report on the strange happenings there. Will the dead return? Find out. Admission $30.00 per person. Other dates will open as needed. Additional shows added as needed. This has become a staple presentation and is considered the number one seance event in the country. This show is not recommended for the very young, weak of heart, those that are afraid of the dark, or easily frightened. The curtain rises at 7:30 PM, and will be featured most Saturdays, and many more dates in the summer by reservation. Seating is limited. Reservations are required and should be purchased in advance. 2) HOUDINI TOUR AND MAGIC SHOW Thanksgiving Weekend. November 25, 26 & 27, 1 to 4 PM. (Friday, Saturday and Sunday) NO RESERVATIONS REQUIRED Tour about the life of Houdini plus a stage magic show with live animals. The Houdini Museum box office number at 570 342-5555 in the theater box office listings. Our world famous Ghost Guarantee! 3) There are no extra hidden performers, or backstage personnel used to create the manifestations or paranormal happenings that may occur. The only two performers in the show are the two performers seen on stage. If you can prove differently you will be awarded the $2,000.00. Each of the three guarantees listed above are independent of each other. In order to qualify for award number 1, you must fully explain and duplicate each of the manifestations occurring in "HAUNTED". You must use your own lighting and sound equipment, as we cannot risk damaging ours, as we have an ongoing show. In order to protect our copyrighted material all props used in duplicating our presentation will become property of The Houdini Museum. I-81exit 190 (Main Ave), Left 2 miles. Year round calendar of Haunted events.